An elderly woman named Gothel witnesses a single drop of pure sunlight hit the ground, creating a magical flower with the ability to keep herself young when she sings to it. Centuries later, the queen of a nearby kingdom falls ill while expecting a child. Her guards find the mysterious flower, which heals the queen and she gives birth to a girl named Rapunzel. Gothel learns that Rapunzel's golden hair retains the flower's healing abilities as long as it isn't cut, so she kidnaps the child and isolates her in a tower, raising the girl as her own daughter. However, every year on Rapunzel's birthday, the kingdom sends thousands of floating lanterns into the sky longing for their lost princess to return. 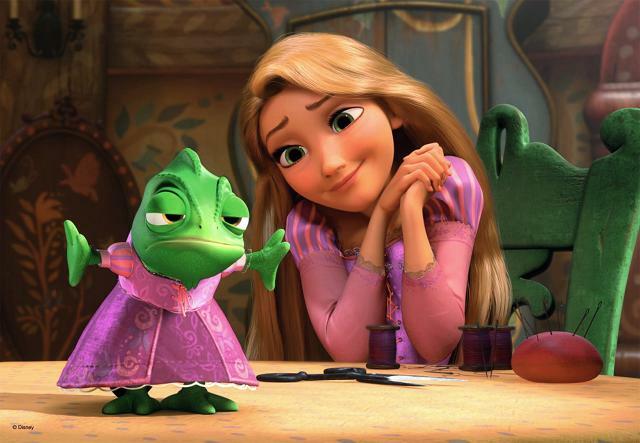 Eighteen years later, Rapunzel lives in the tower with her pet chameleon, Pascal. Rapunzel asks Gothel to let her see the floating lights on her birthday, but Gothel denies her request, saying the world is full of people who would covet her abilities for themselves. 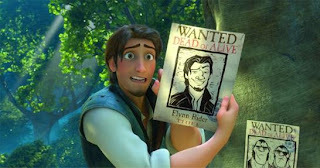 Meanwhile, thieves led by Flynn Rider, steal the tiara of the missing princess from the castle. Flynn abandons his accomplices and stumbles upon Rapunzel's tower, choosing it as a hideout. During the chase, the lead guard's horse, Maximus, is separated from his rider and continues the search for Flynn on his own. Once inside the tower, Flynn is knocked unconscious by Rapunzel, who then hides him in a dresser. Rapunzel tells Gothel that she wants a special paint for her birthday. Gothel agrees, and after she leaves, Rapunzel makes a deal with Flynn—if he escorts her to the lights and back, she will return the tiara. While Rapunzel is excited to be free, she is soon conflicted between her freedom and her guilt of disobedience. While traveling, the two visit the Snuggly Duckling Tavern, which appears to be full of thugs like Gothel warned Rapunzel about, but they all each have their own dreams, just as Rapunzel does. As the royal guards continue their search, Gothel learns of the pursuit, returns to the tower and finds Rapunzel gone. The tavern regulars help the pair escape from the guards, but they eventually corner Flynn at a man-made dam, which Maximus inadvertently causes to collapse. 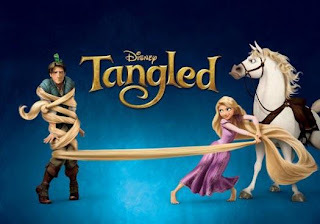 Trapped in a flooding cave, Rapunzel reveals her powers to Flynn, which enables them to escape safely, and Flynn reveals his real name, Eugene Fitzherbert, and his reason for being a thief. 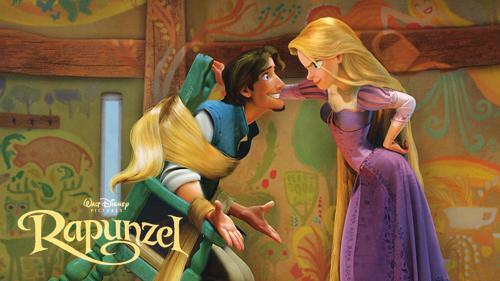 While Flynn gathers firewood, Gothel secretly meets with Rapunzel, who tells Gothel she has feelings for Flynn. Gothel says he's only after the tiara, and that Rapunzel should give it to him as a test. The next morning, Maximus confronts Flynn again, but Rapunzel befriends the horse and the group travels together to the royal kingdom. That night, Rapunzel gives Flynn the tiara, but he realizes as they watch the lanterns that it's Rapunzel he wants. Seeing his former accomplices, Flynn attempts to give them the tiara, but the pair are now working with Gothel. They make it appear that Flynn is escaping with the tiara, and Gothel, betraying the thieves, "rescues" the heartbroken Rapunzel and takes her back to the tower. Flynn, sentenced to be hanged for his crimes, learns of the treachery from the captured henchmen. The Snuggly Duckling regulars rescue Flynn and deliver him to Maximus, who takes him to the tower to find Rapunzel. Meanwhile, Rapunzel realizes that she is actually the long-lost princess, and she confronts Gothel with the revelation. 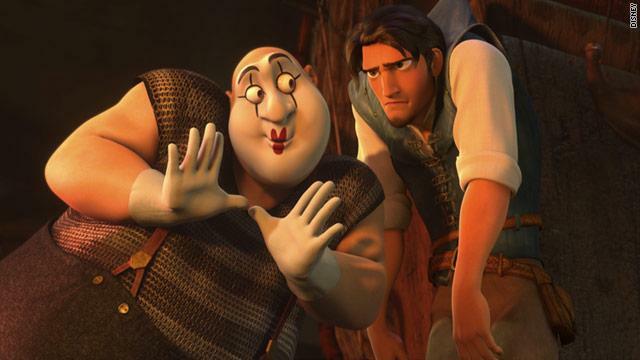 Flynn reaches the tower, but upon entering, he sees the bound Rapunzel and is stabbed by Gothel. Rapunzel pledges to remain with Gothel forever if she can heal Flynn's wounds. Gothel agrees, but Flynn, saying that he would rather die than have her trapped forever, cuts off Rapunzel's long hair, destroying its healing power. Gothel screams in horror as her true age begins to catch up to her, and as she writhes, trips on Rapunzel's hair and falls out of the tower window, turning to dust before she hits the ground. Flynn reveals his love for Rapunzel, and succumbs to his wounds. Heartbroken, she tearfully tries to sing the incantation as a single tear lands on his cheek and miraculously heals him. The group returns to the castle, where the royal family is reunited at last. In time, Flynn and Rapunzel get married, and live happily ever after as the pub thugs fulfill their individual aspirations, and Maximus becomes a respected official on the Royal Guard.